The following is information from Mr. A. Wahab Kamal. Mr. Kamal is 45 years old, living in the US but returning to his own country of Afghanistan in the near future. This information was from a talk given to the Afghan Hound Club of Greater Houston. I am taking the liberty of paraphrasing his talk, and any inaccuracies are my fault. I will try and be as factual as possible. His father, and his father before him have always had Afghan Hounds, or Tazi. In fact he has had 105-120 family years with these hounds. His father expired at the age of 93, and hunted with his hounds up to the end. 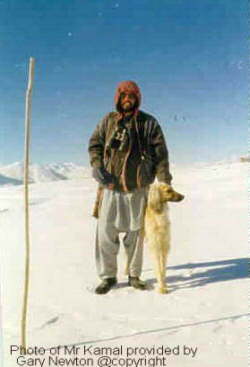 Mr. Kamal hunted with his hounds up to a few years ago. But the hounds are still there. Lifestyle: never came into a house. Ran wild with no confinement. came to the house at suppertime, and when it was time to hunt. Very loyal to those that feed and hunted with, but otherwise...very up yours attitude. Very pack oriented with fighting very often. This was especially when someone from another town, or another family within the town took their dogs hunting together. When they got together....fights, until they started walking to the mountain, and then all fighting forgotten, just hunting. Young pups chase cats at early age, then graduate to fox, then hare/rabbit, then “deer”. Would also hunt wolves and “tigers” with bigger packs when needed. These dogs were totally fearless. Conformation: The biggest difference was the coat. They never bath or comb the coat. It is shorter, much like the old pictures of the hounds in England when they first came over. They do cut mats out, and keep the coat relatively short as when they work in snow, this minimizes the snow building up in the coat. Short loin, square, big feet, broad chest. those with narrow chest tired after one course, but those with wider chest coursed all day. Color important.....black masked reds only. They seemed to have the desire and speed needed. He had bred to an American import belonging to someone that had brought an Afghan hound in while working at the Embassy. Liked the conformation, but puppies slower than his other dogs. Breeding: sounded like everywhere else. Other towns just let them breed wild, but the hunters were very selective. Best hunters to best hunters. It was interesting that the fox would fight and inflict injury. The males were careful, but the females went straight in. This was considered very good. Most Tazi where red or red variations. Very rare for black or black and tan. Saw a Dominoe for the first time at our Specialty and AHCA Breeder’s Cup. Where are the dogs: each town has many Tazi, and each “hunter” usually keeps two. He is from a town just west of Kabul. He indicated that most of the Afghans were located from his town and then central and west. The further west, you got into desert area, and then hounds began to look like “greyhounds with flat hound ears”. We thought that sounded like smooth Salukis. Hunting: The hounds hunted differently if they were from the same pack, or if other hunters brought dogs. When packs were mixed, there would be tearing of the prey at the end, but the hounds never eat the prey. If hunting from the same pack, they would run and catch the rabbit, and hold it with a paw until the hunters arrived. Fox were killed, because they “bite”. Deer were injured so that they could not escape, but the final kill was done by the hunters. Both desert and mountain dogs were fast and short loined. They free course at all times. Tails up in “normal” position at the beginning of the hunts, but carried low after a little while, but used as a rudder when running. They walk and trot (“much like the show gait”)with their heads up almost all of the time. They poke their heads into brush, but do not use their noses for scenting “like your hunting dogs...with birds”. They cast about, heads high looking for flushed game to chase. They bounce up and look all about if cover is to high. This is different from what the OFC people have been talking about as to how the sighthounds hunt in this country. Maybe here, this is a learned behavior, as they also hunt by scent. In Mr. Kamal’s experience, very little to no scenting, just scanning and sight......hunting. ( he really laughed at these ), and our best wishes. He will be returning, and has made friends with those Tazi owners here in Houston. We hope to further learn, and pass that information on. .